If you’ve been following our series, you know why you should crate train your dog, and you’ve picked out the perfect crate for him/her. Next we’ll talk about how to crate train your dog. No, you can’t just shove him in the crate, shut the door and leave him alone. That would terrify any dog that has never been in a crate before. Of course, is you’ve adopted a rescue dog, chances are that he is already, at least partially, crate trained. Have you found a spot for you [amazon_textlink asin=’B0069HBGUQ’ text=’dog’s crate’ template=’ProductLink’ store=’fosterpack-20′ marketplace=’US’ link_id=’894edac7-13ee-11e7-991d-3397a79e8947′] yet? Once you’ve started crate training, it’s a good idea to keep the crate in the same spot, at least until he/she is fully trained. Then you can move the crate around until you’ve found the perfect spot. Our big boys started out ten years ago in our bedroom, in our previous house. When we moved, their crates moved all over the house, until we found the perfect spot. In their own bedroom, once our son moved out. Once your dog understands the crate, he’ll go into it most anywhere. The other dogs crates have been pretty stationary, at least room wise, from the beginning. Although, some of them have switched from plastic dog crates, to metal dog crates. If your dog is an older, or reliably non-destructive dog, you can add a bed, pillows, blankets. Whatever makes, him the most comfortable. In the size crates I use for my big boys, a standard size bed pillow fits great. I put on two pillow cases, one going in each direction, to completely cover the pillow. These can be pulled off and washed, without have to wash the pillow itself. They also have flannel blankets, and each has a [amazon_textlink asin=’B0002566H4′ text=’Nylabone’ template=’ProductLink’ store=’fosterpack-20′ marketplace=’US’ link_id=’9cf6716b-13ee-11e7-86d7-6b6c07a11d9d’], to keep them occupied when I have to be out of the house. If you do put toys or chews in the crate with them, make sure it’s nothing that they can get a piece off and choke on it. If you have a new puppy, a single, chew-proof blanket is best. I like fleece or [amazon_textlink asin=’B018A1DGD8′ text=’flannel throws’ template=’ProductLink’ store=’fosterpack-20′ marketplace=’US’ link_id=’b1a9aa84-13ee-11e7-a085-13d13aed510a’]. They don’t shred as easily, and are readily washable. Once your puppy gets a bit older, and is out of the destructive phase, you can add a bed. Now that your dog’s crate is all set up. The first step to crate train your dog is to introduce him to the crate. Let him go in and check the place out. Toss a few small treats into the crate if he’s hesitant to go in. But don’t shut him in it yet. Let him thoroughly check it out and go in and out for a little while. It’s always best to take your dog potty before putting him in the crate, no matter the age. I try to tire mine out with a play session before crating them if I’m going to be gone for more than a couple of hours. Once he seems comfortable with the crate, throw a few treats in. Then when he is eating them, shut the door for a few seconds, to a minute or so. Staying in sight. After a bit, open the crate calmly. Don’t get excited, or he will too. Practice this for a while, letting him in the crate for longer periods of time. Take your time and don’t overwhelm him. You want his crate to be a happy place for him. A positive experience. Once your dog is comfortable in the crate, with the door closed, try leaving the room for a few minutes. If he does fine, try leaving him in the crate for up to an hour. If he starts whining or crying, DO NOT panic. Stay calm and wait until he calms down before opening the crate. You do not want him to think that whining and crying will get him released. The more often that you acknowledge his crying and whining, the more he will continue the behavior. Practice leaving your dog in the [amazon_textlink asin=’B00QAVNYGK’ text=’crate ‘ template=’ProductLink’ store=’fosterpack-20′ marketplace=’US’ link_id=’be7b11c0-13ee-11e7-95a6-ebe27b97be1b’]for longer and longer periods of time while crate training. A basic rule of thumb for puppies is one hour for every month of age, up to 8 hours. Even an adult dog shouldn’t be crated for much more than 8 hours. You can use a command word when your dog is entering the crate also. We use “Bedtime”. Anytime that word is spoken loud enough in the house for the dogs to hear, they all go to their crates and wait for me to come around and pass out the goodies, and shut the doors. The most important thing to remember when trying to crate train a dog, or puppy, is not to give into the crying or whining. The more you give in, the more it will continue. Shutting the door, is important too. It’s something I sometimes forget to do. We also have one dog, Woobie, who dislikes any bedding or blankets in his crate during warm weather. He’s okay with it during the colder months, but as soon as the temps climb into the 60s, his blankets and pillow are pushed out of the crate. He won’t leave even a single blanket in his crate. It’s each dog’s preference, I guess. Also, never use the crate as a punishment. Ever! You want their crate to be their safe haven, not a punishment box. 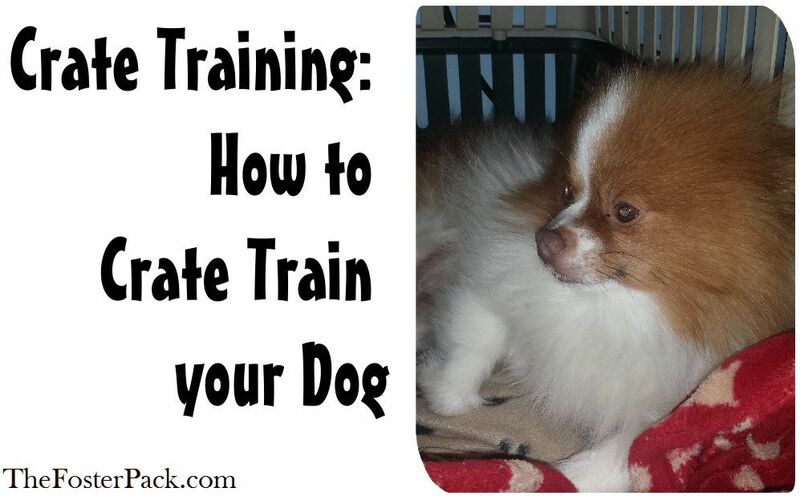 Our next post will help if your dog keeps crying and whining in his crate. Check back tomorrow!